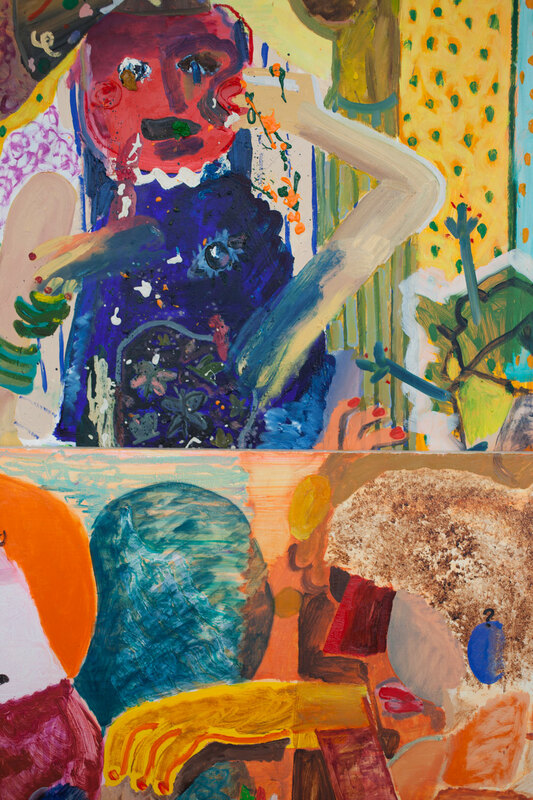 We had been following Shara Hughes’ work for quite some time but had never seen her paintings in person nor met the artist herself. 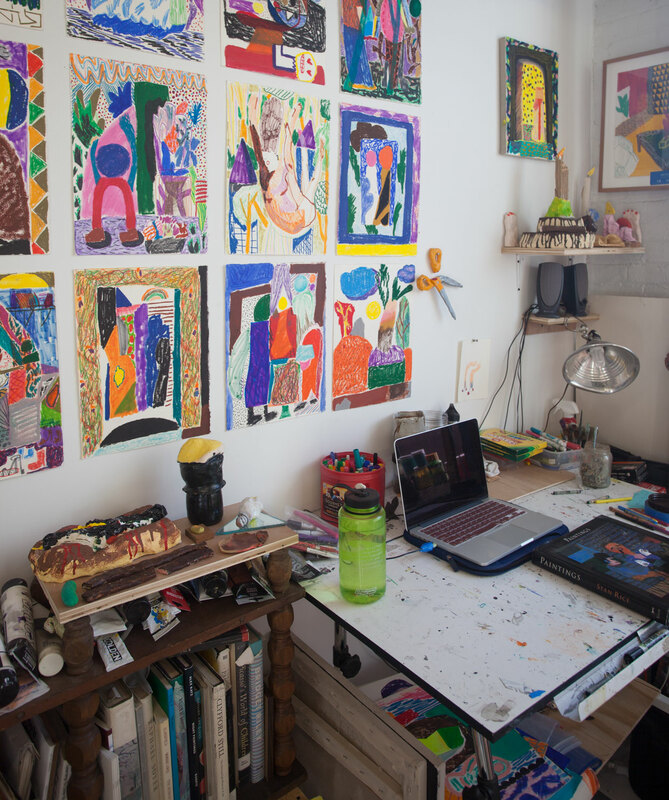 It was by chance that we ventured out for Greenpoint Open Studios and walked into her shared studio space where we instantly recognized her work. 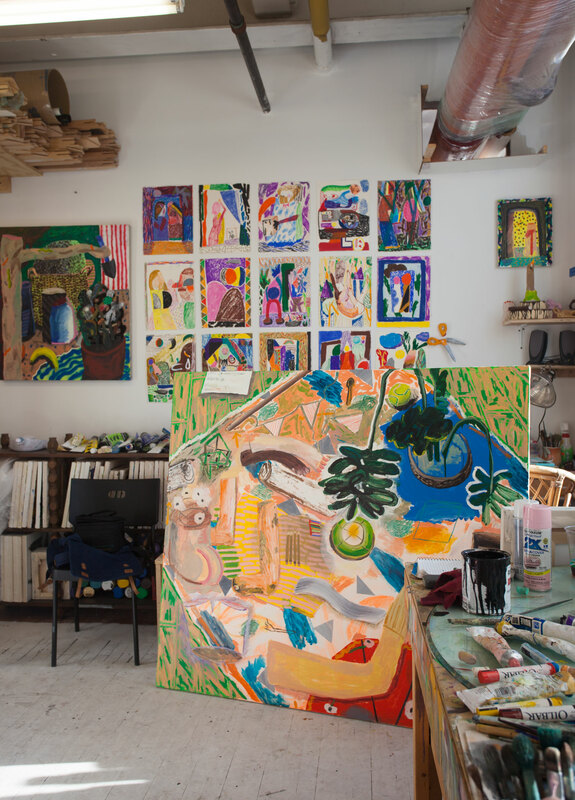 During our studio visit, we talked a lot about her paintings and her drawing practice and what it was like to move studios from Atlanta to Brooklyn. 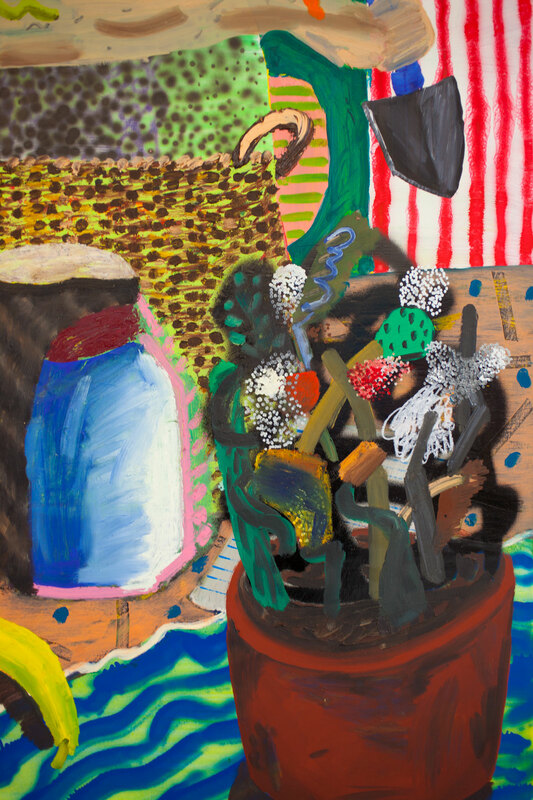 Shara Hughes’ work draws you in to look longer and investigate deeper on what is going on in each painting. 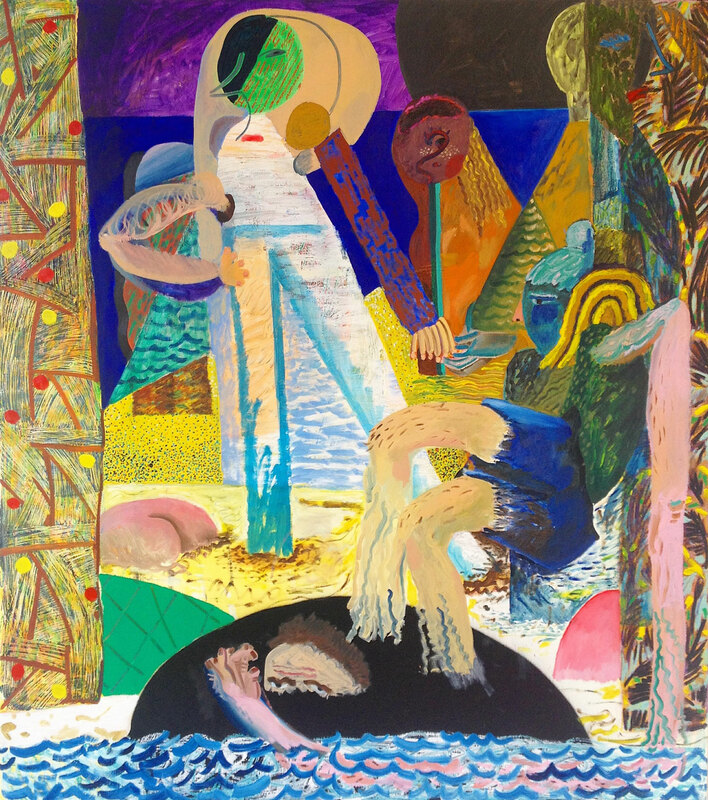 Each piece is loaded with layers of colorful combinations of paint and a variety of marks making up the abstract imagery of figures, portraits, and objects which are all loosely based on Hughes’ life. 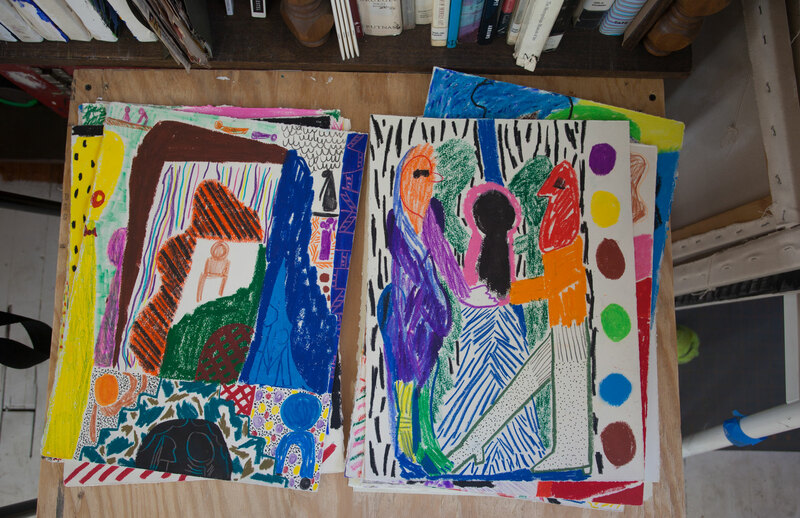 What is also interesting to see in conjunction with Hughes’ paintings, are her stacks of crayon drawings which feel very much “finished” and complete in their own way. Hughes uses her drawings on paper to make “formal decisions” in a more immediate and less precious way and to inform her as she paints. 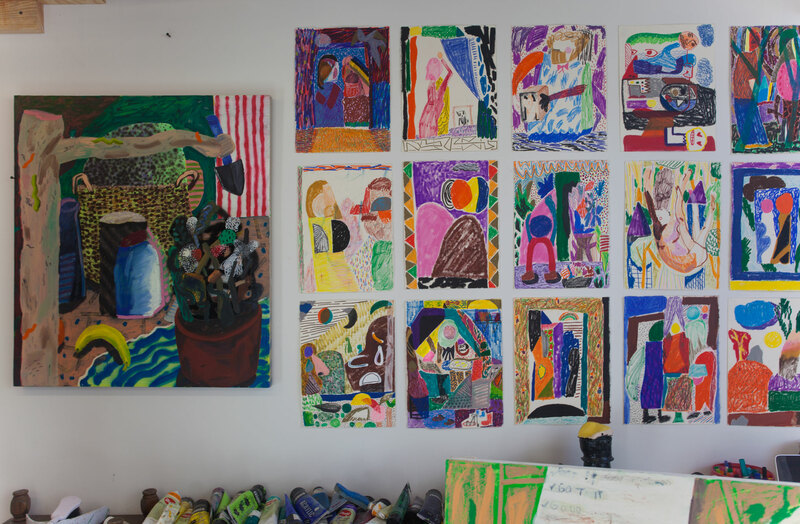 Shara Hughes is a RISD graduate who has also gone to various artist residencies including Skowhegan. She is currently living and working in Brooklyn. 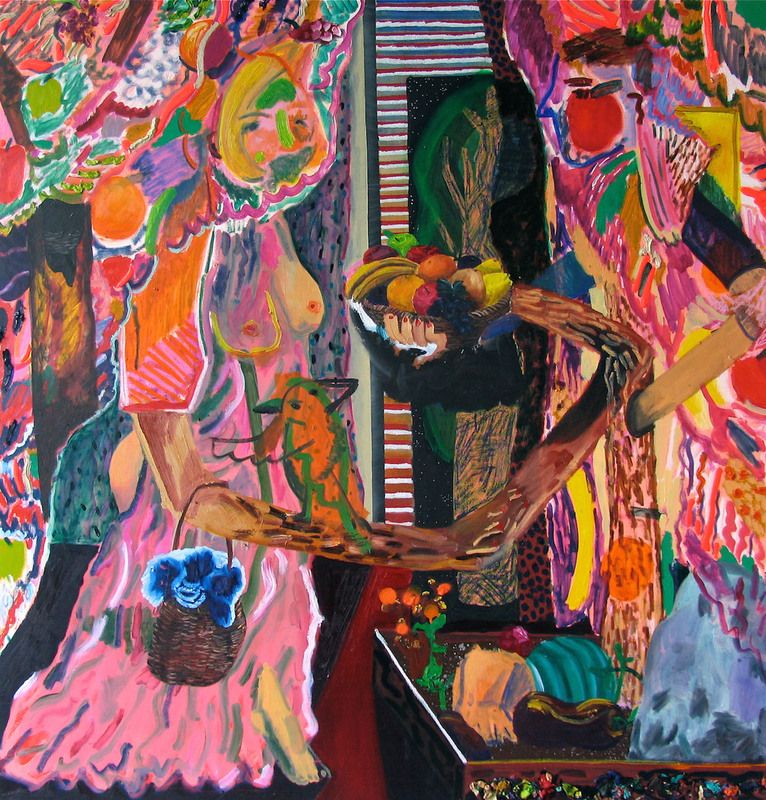 Her work has been exhibited in MOCA GA as well as exhibitions internationally. F: How do you come up with the imagery? Can you walk us through your process? SH: The imagery is all based on what is happening in my life, but I never know where it’s going to go when I start. I start very abstractly with some kind of wash background and begin to pull out shapes formally. The painting begins to take a life of it’s own and eventually some kind of story comes out of where it’s going and pulls it down to a solid idea. This may not happen until the middle or end of the painting. Some times I’ll have a title in mind when I start the painting and it builds around that idea, but most of the time that changes too. Working abstractly until the painting is kind of ready to take on a life is a way for the work to be more open and evolve organically as opposed to some idea I just come up with and then execute. F: How long does each image take to build up? Do you ever revisit a painting once it’s “completed”? SH: If I work on a painting for a week and have enough time in my studio to stay in there all day, an image rarely comes up immediately. It usually takes a day or two of me flip flopping on how much ‘fun’ I’m having when I ‘don’t care’ about where the work is going and how terrible I think it’s going. The extremes of those two thoughts are pretty frequent until I’m in a gray zone of something I can work with. 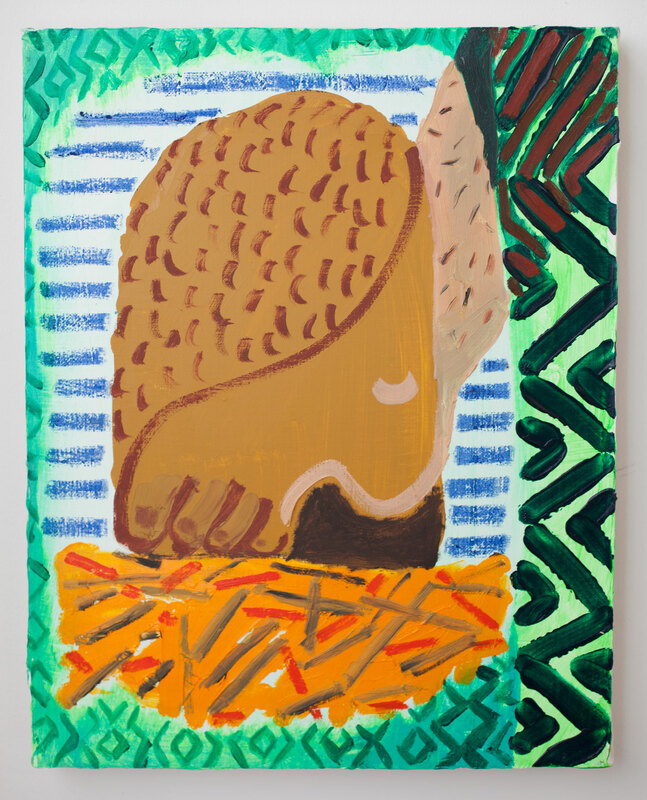 SH: I have revisited a painting once or twice after it was completed and it was kind of a disaster. If it doesn’t really work in the first place, I think I just suffocate it. If I revisit the piece a year or so later once I’ve kind of moved on from the first, it turns into a not so great painting. I think it’s hard to let something die, so there’s some kind of hope in revisiting something but for me it usually just makes it worse. In a way, the ideas are always getting revisited, so it makes less sense to work on a mistake when I’ve already gotten over it. 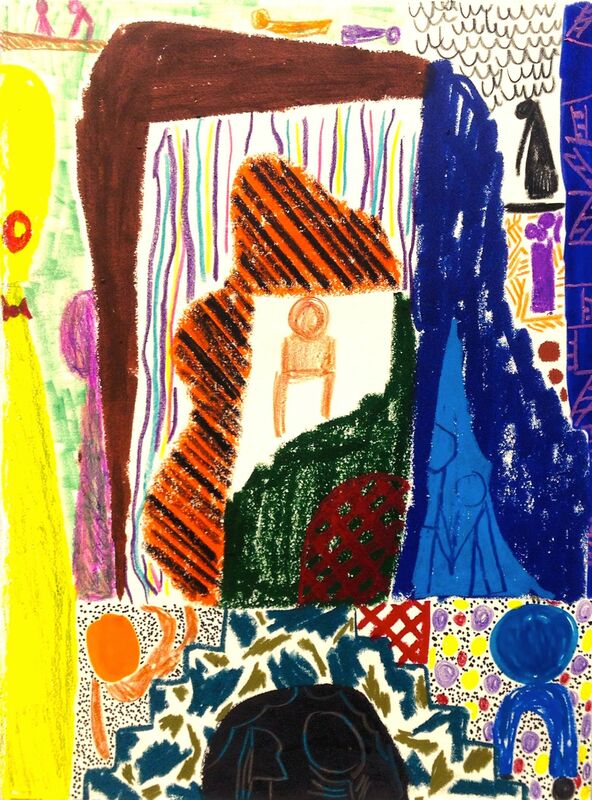 F: The drawings seem to get looser, exploring more of the mark and color relationships and less about a defined space. Can you talk a bit about how your drawing practice influences your painting practice? Do you paint from your drawings or use them as exercises informing the painting later? Do some of the same marks internally work their way from the drawing to the paintings or is it by chance? SH: I keep the work on paper practice separate from the painting practice because my state of mind when I’m working on both is very different. There’s a feeling of looseness with the work on paper partly because I haven’t made many drawings in the past few years and also because theres an ease of getting rid of paper whereas a stretched and prepped canvas seems more important. The drawings are a really great way for me to get out of my head and think about formal decisions in a more immediate way. I’ll make drawings for a month or two and then have them around to inform the paintings, but I rarely work directly from one drawing to a painting. Actually, I have one painting I just finished that I made directly from this series of drawings. I think there’s an interesting connection between the two but they also seem different. 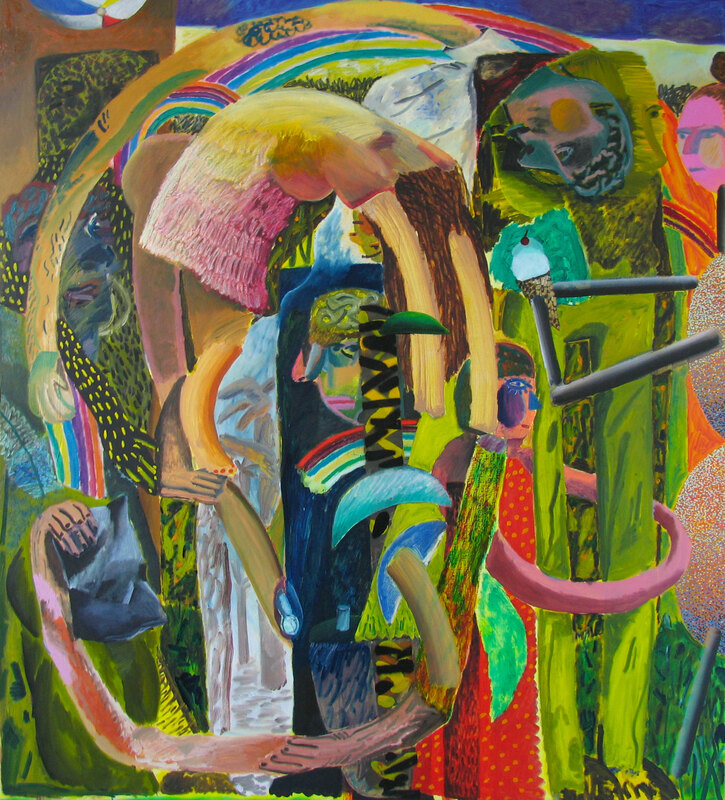 F: The imagery in some, especially the larger works, seem disconnected when you look at each specific image. 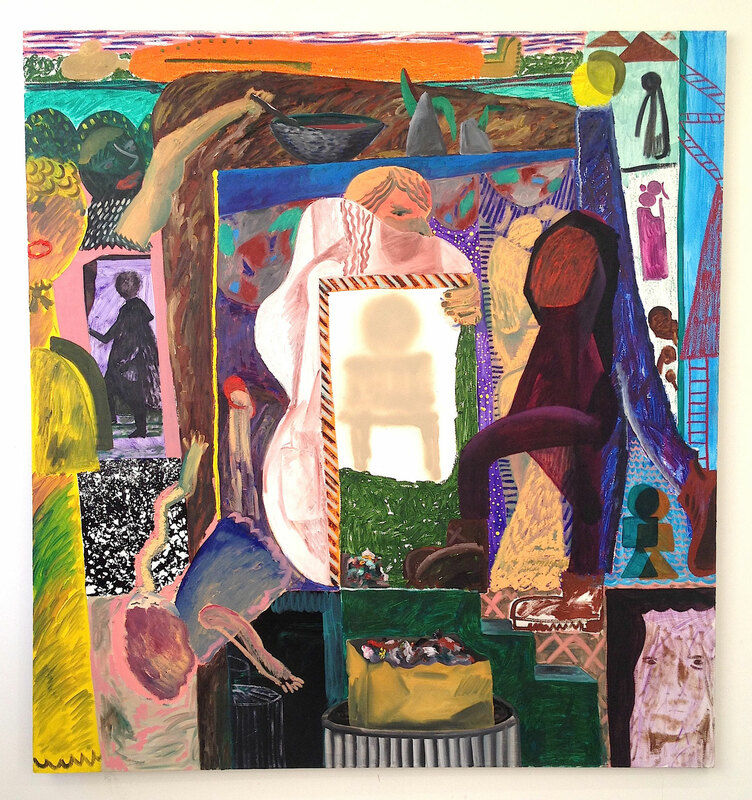 They look put together almost like collage because of the breaking up and confusing of objects and subjects but also from the textures and colors that create a multitude of different vocabularies. 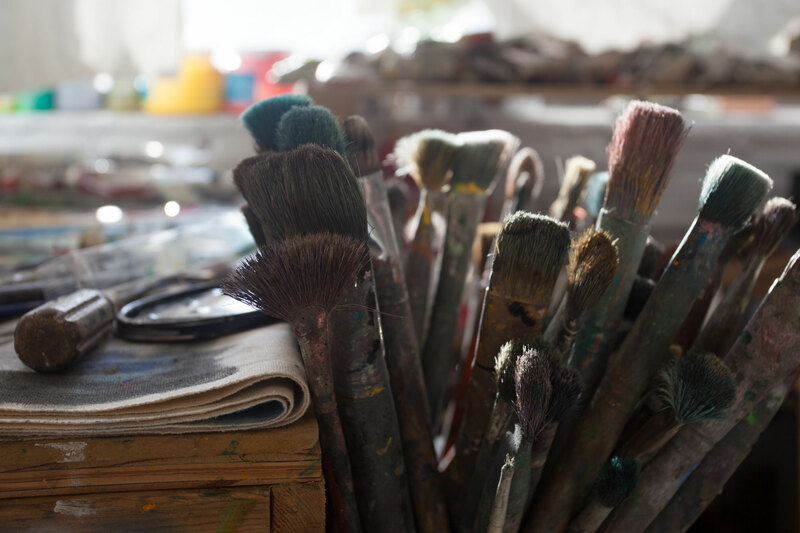 I see a lot of different types of textures and marks in your paintings other than marks that obviously look like they’re made from oil paint, what other materials do you use? SH: I use oil, acrylic, spray paint, paint chips, airbrush, and oil bars. I like the thought that one specific instance in one painting can be something like a hat, but if placed in the painting next to it, it may turn into a hallway or part of an arm. This kind of idea speaks to how thoughts are formed. Much like a sentence to a story … you change one word, and it means something different. You change one thought pattern and it feels different. You change one thing formally, and it looks different. That kind of awareness is something I’m interested in. F: Do you have a “vault” or grouping of different painter moves and marks that you use in a given canvas? How often do you find a new one? Is it through the description of objects that you determine the mark? Are you more conscious of how you set up your vocabulary to the point of “Wouldn’t it be funny to paint fingers this way” or is it a process of more unconscious decisions? SH: Actually I feel like sometimes I use certain things too much. I think there is a large vault of painter moves that maybe everyone uses but to find something that surprises yourself is interesting. It’s nice to have something to use throughout the body of work to make it consistent at times, but I think it’s good to make sure you know why you are using it and not just as something to lean on. I think it’s tricky to get out of thing things you know that work, and I don’t think you have to. I guess since my work is particularly made up of different types of marks, I’m especially aware of being ok with using something predictable and being aware of it’s over use. F: You recently moved from Atlanta, GA to Greenpoint. How was that move?! Moving your studio and apartment up here probably was a shock in terms of the small spaces. 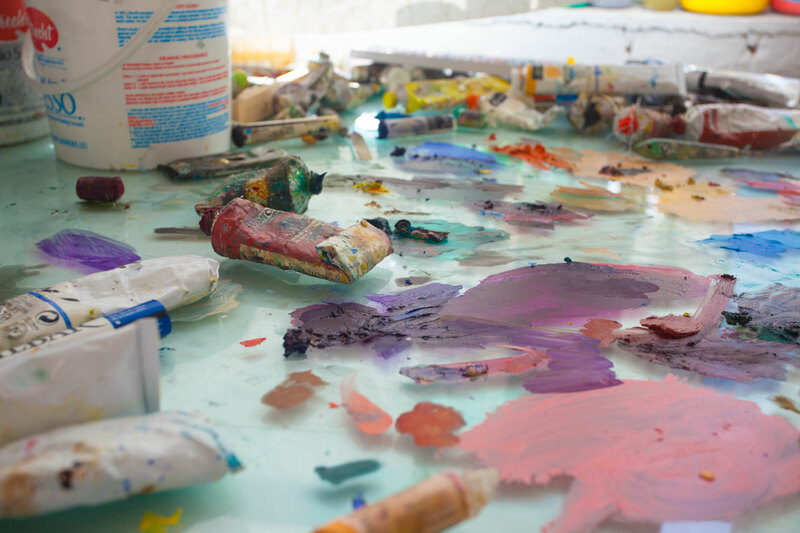 How did you find your current space and how long did it take you to settle in and start painting? SH: I feel like I’m still settling in. I’m sure my experience will all reveal itself in the work at some point. Last time I lived in New York I was making work about being trapped and crammed in small closets. I’m hopefully out of that feeling this time around as I definitely feel more regular as a person. The space thing is different, but something I was expecting. Theres a shifting work around dance that happens too much and I think would take up less time if there were more space, but it’s not a huge deal. I really love being back in Brooklyn but miss Atlanta as well. 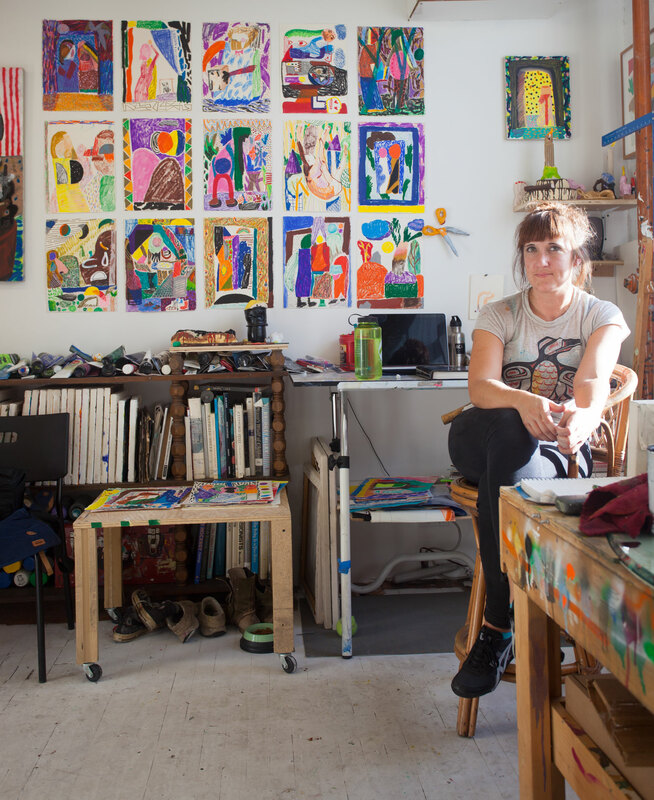 F: What are some things you had to do to make your studio, your own? SH: Well, I’ve done a lot of residencies so the moving around thing to make work is something I’m pretty comfortable with, but the permanent move feels different than the thought of leaving in a few weeks. I have a big rolling palatte my moms neighbor made back in Atlanta that is really nice. Otherwise, I just bring my dog to my studio. 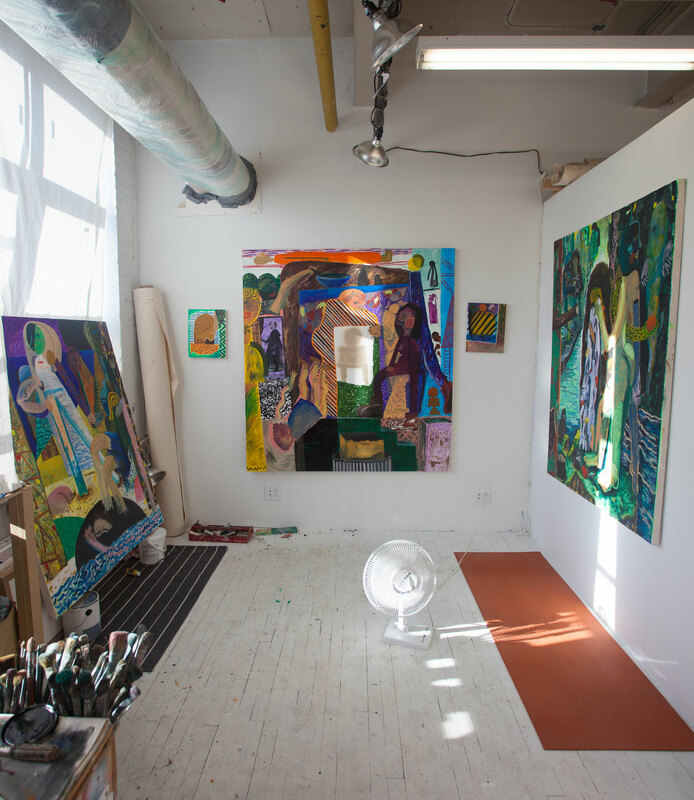 F: Have you seen any change in how you are working in your studio or has your work changed at all since the move? SH: I haven’t seen much change yet, but I haven’t really been in there too long. I think the drawings are different and I will probably make more of those this year.